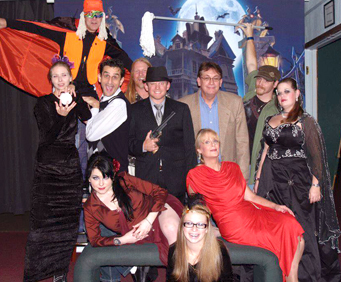 Previously known as the Ozark Murder Mystery, there is no show in town quite like the Almost Famous Murder Mystery show experience! If you are looking for a memorable and exciting way to spend the evening in Branson and you enjoy suspense and mystery, you will absolutely love the Almost Famous Murder Mystery. Upon arrival you'll be seated by friendly staff. Get your thinking-cap on for the murder-mystery clues that are coming. Keep careful track, and don't be tricked. Your clue sheet will be scored during intermission, and whoever has the best score wins a 'killer' prize! Dinner is also available for purchase on site. The fun, entertaining performers in this show appreciate audience participation. Feel free to holler out, make wise-cracks, and enjoy the unique atmosphere of a murder mystery comedy show! Spirits (Feb 13-May 24) - Join the cast of Spirits a group of bar patrons, as they try to figure out who murdered one of their own right before a big darts tournament. As they get snowed in and trapped with the murderer, you will need to help figure out the culprit before they strike again. Killigain's Island (June 5- Aug 23)- When a widowed millionaire decides to take a trip on her yacht, she is shipwrecked on a deserted island with the rest of the crew. When one of them ends up murdered, they have to figure out who the culprit is before they become the next victim. 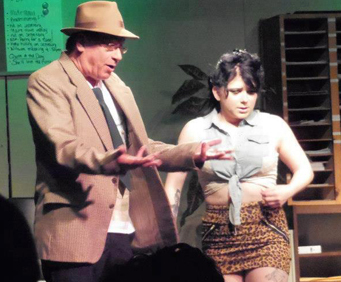 Stage Fright (Sept 4- Oct 31) - Set in Sin City, this murder mystery takes place in a popular comedy club. The actors and actresses causes personal friction back stage and someone ends up dead. The audience helps to question the remaining cast members in this classic whodunit show. Home (Wrecker) for the Holidays (Nov 6- Dec 31) - Natalie and Bruce Anderson seem like the perfect couple; however, in their unhappiness, they book flights for tropical getaways during the holidays. A phone call from a family member draws them home for the holidays, where they struggle to keep up their image of perfection. When one of the family is killed, the mystery begins. Who will be next? A wee bit hokier murder mystery, but enjoyable. Miss caroline needs to tell you that you need to pay attention because you will be asked to figure out who is the murderer. The food was good and the show was above average. "The show was do funny!" The show was do funny! The actors engaged and played off the audience very well. Dinner was huge and so good. We will definitely be going back!